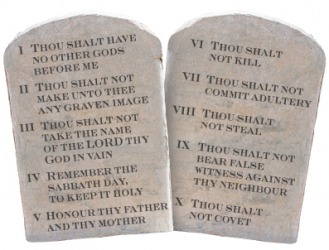 MONTGOMERY, Ala. — The Alabama Senate has approved a bill that would place on the ballot a proposed constitutional amendment that would allow the Ten Commandments to be displayed on public property. The measure put forth by Sen. Gerald Dial, R-Lineville, requires the Decalogue to be a part of a broader display that includes other historical pieces. “The proposed amendment would propose a constitutional amendment which would provide that property belonging to the state may be used to display the Ten Commandments and that the right to display the Ten Commandments on property owned or administrated by a public school or public body is not restrained or abridged,” S.B. 139 reads. property owned or administrated by a public school or public body,” it outlines. The bill, which additionally contains language protecting religious freedom and association, also includes a prohibition on using public funds to defend the constitutionality of the amendment. The measure was approved by the Senate 23-7 on Thursday, with all seven in opposition being Democrats. It will now move to the House for a vote. If it passes, the measure will then be placed on the ballot for voters. “Proposing an amendment to the Constitution of Alabama of 1901, providing for certain religious rights and liberties; authorizing the display of the Ten Commandments on state property and property owned or administrated by a public school or public body; and prohibiting the expenditure of public funds in defense of the constitutionality of this amendment,” the ballot initiative will read.